BioEM2015: thank you from the Presidents! BioEM2015 and Asilomar are now just good memories. It was great to have the annual meeting this year in such a wonder place that Asilomar Conference Grounds is. If you could reach it, that is, because the fog on Monterey airport caused a number of colleagues quite some extra travel time. But when after several days the skies cleared, the views over the ocean were magnificent. Those who stayed (too) long in the garage for the poster sessions (and what came with it) missed a couple of beautiful sunsets! Meetings like this cannot be succesful without the effort and dedication of a great number of people, and we would like to thank them. Rich Nuccitelli and the other members of the Local Organising Committee, assisted by Pam Nuccitelli and of course Lisa Marciano and her colleagues at Peak Travel, worked hard and long hours to get all the arrangements in place in order for the meeting to run smoothly. Meeting at the Asilomar Conference Grounds has the benefit of continous and close interaction with a lot of people, due the common meals and evening activities, next to the scientific meetings, that took place in very historically interesting and well-equipped meeting rooms. Except for the parking garage were the poster sessions were held, that definitely missed any historical perspective and atmosphere, but that was compensated by the ample room and time to move around and talk to colleagues, and to enjoy the food and drinks. The highlight of the social activities was, of course, the dinner at the Monterey Bay Aquarium. This was by far the most beautiful setting for a conference dinner ever. 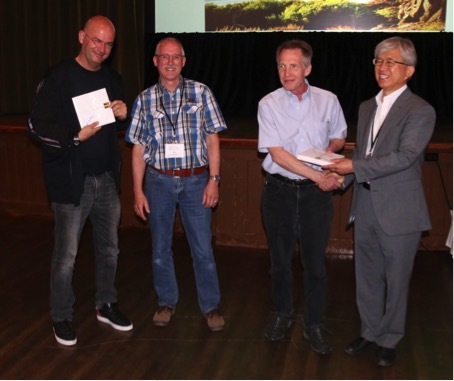 BEMS President Nam Kim (right) and EBEA President Eric van Rongen (second left) thanking TPC co-chairs Tom Vernier (second right) and Niels Kuster (left). The scientific programme was, as usual, very interesting and again contained some novel issues, such as the evening poster sessions. We thank the Technical Programme Committee, chaired by Tom Vernier and Niels Kuster for this, as well as the dozens of reviewers of the abstracts. Our thanks also go the plenary speakers and the workshop convenors and presenters, but of course also to the people who presented talks and posters and the chairpersons who (mostly succesfully) tried to keep them in time. This meeting had a particularly large number of students, and the flash presentation sessions were a good way for those who had posters to get their moment of fame, be it only for 3 minutes. The Student Awards Committee was once again chaired by Alexandre Legros and Heidi Danker-Hopfe. With the help of a large number of colleagues who judged the student presentations and posters, and the technical infrastructure of the Lawson group, run by Jeffrey Carson and Astrid Chamson-Reig, they organized the Student Awards competition. Thanks to all and congratulations to the winners! Finally, the BioEM meetings would not be able without the contributions of the sponsors. We therefore thank EPRI, MMF, KIEES, NIH, GSMA, Electroblate, the Environmental Health Trust, and ZonMw, for helping to make BioEM2015 happen. See you next year in Ghent!